Green Mountains in Vermont (Mount Hunger); photo © Joe Forjette on Flickr (noncommercial use permitted with attributuion / share alike). 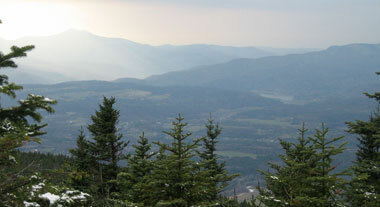 Green mountains are a prominent theme in Vermont's symbols: the state nickname is "Green Mountain State;" mountains are featured on the state flag and represented on the state seal; and the state's name originates from the french "Verd Mont" (green mountain). are my home. They belong to me. May they be strong and forever free. And look with pride on the golden dome. These green mountains are my home.